Segway riders cross 14th Street downtown. John Moulton is suing Charles Ward. The two are former business partners, jointly operating Richmond Trolley Co. 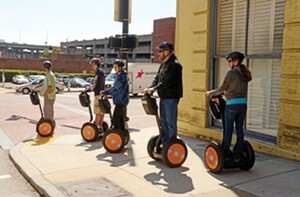 But things soured and Ward now operates a trolley company out of his Segway tour and dealership company, Segway of Richmond, while Moulton has opened a competing Segway shop, River City Segs, and has taken control of their Richmond Trolley fleet of five buses. In a lawsuit filed earlier this year Moulton accuses Ward of stealing trade secrets and hijacking confidential customer information.